Errol: Allo all! You must forgive me for not getting to comments yesterday, I had a bunch of stuff to do. I know I asked you guys a question, and then didn’t get around to commenting! Gah! Here’s hoping we see one more pre-NaNo freak out from Jen tomorrow. I was channeling her 2 nights ago, when I was trying to focus on my outline. My husband and son were here, and I was talking to them about how I didn’t feel like I was ready. Apparently I got a little over-enthusiastic in my concern (okay, I was screaming something about it being only a few days away), because my son said something like, “You’re freaking out like other people do about NaNo.” It was so noticeable, because I’m not usually like that. I am a bit more anxious this year, apparently. I love nanotoons! I’m so glad we get another year of them! I like how the cast has a variety of nano types. Some who barely make it, some who barely try, some overachievers, some freak outers… really makes me feel “normal”. Thanks for that! I’m MLing for the first time this year so I’m super nervous but everything’s going well so far. 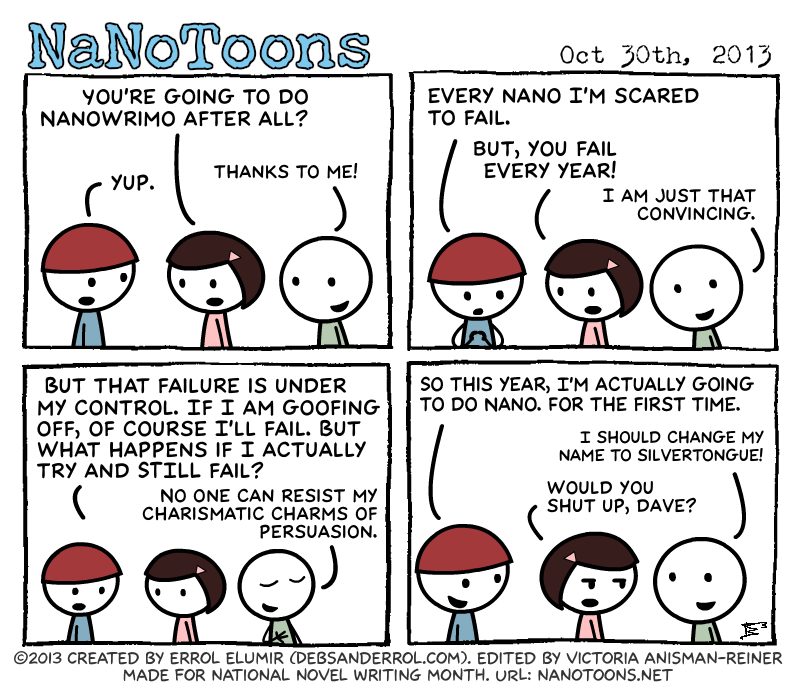 NaNoToons are awesome – they’re all so accurate!